Lake Sevan is in Gegharkunik, one of the most spectacular regions in Armenia, its stunning landscape shaped by millions of years of volcanic eruptions and the once steaming waters of the lake, now cooled to a brisk 18°C at the beach. Sevan is Armenias largest lake and a summer magnet for thousands of locals who bask on its manmade beaches and party in one of its booming resorts. If Armenia has anything like a Mediterranean character, Gegharkunik is where you’ll find it, with friendly beach combers looking for that perfect sand, ski jet, and bikini. The lake (also called Gegharkunik through much of its history) is a stunning body of water, and in spite of the ecological risks it faces through mismanagement, uncontrolled tourism and locals notorious penchant to litter everything in their reach, it never fails to impress with its unpredictable moods, reflected in its jet-black to aquamarine colors. 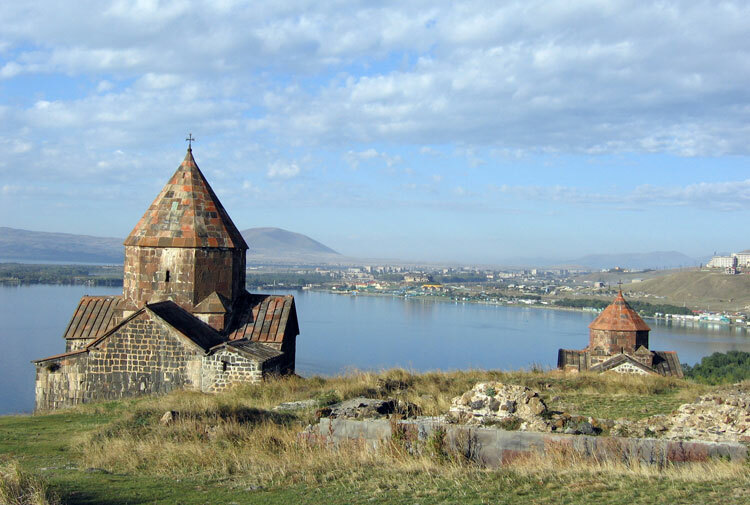 And Sevan is the recreation spot in Armenia, for locals and tourists alike. Over 160 beach resorts, from the humblest beach front with a few «domiks» (metal huts) and camping spots to the most pretentious hotels in Armenia angle for trade and on a July or August weekend night they are almost all full. The hub of all this summer fun is the Sevan peninsula, with an 8th c monastery overlooking the beach-partying crowd, who revel in the water by day (sailing, skiing, paragliding, water boarding, jet skiing) and party onshore at night (disco, disco, disco). Local inhabitants take all this in stride, eking out their livelihood serving the beach combers (selling hot chestnuts, grilled corn and fish) or tilling the upper plots of farmland. And there are rewards for those willing to look a little deeper and climb a little higher, with villagers welcoming the wayward soul into their homes and hearts, for a little tea and sweets and plenty of local lore. Do not let the beach revelers fool you, this is a hard-knock existence, villagers are snow-bound four months of the year. And precious few tourists bother to go beyond the next khorovats stand or beach party bingo. Locals are impressed by those who bother to look into their side of the world and take particular pride in whatever they have, be it an Urartian fortress or a medieval monastery.